Anita’s 2011 Christmas Letter: Merry Christmas, dear readers! Thanks so much for reading my blog, and for your comments and encouragement. I have written a personal blog, so some of this may be old news, but anyway, here’s our year. WORK—The biggest positive change in our lives occurred the month I began blogging, April 2010. Roy decided to resign his Professorship of mathematics, and expand the little publishing company I founded (I found the running of it overwhelming as all I wanted to do was read and write) Roy also runs our house, children and lives. A tall order!! Well, we’ve got 12 clever people on payroll—mainly part-time, though a couple of full-timers. These range from a friend from Somerville College. Oxford, nearly three decades ago, to friends from St. Aldate’s, and friends from the blogosphere, and the clever underemployed people always floating around Oxford. We’ve had 5 new people join us this year. Roy has used his Maths Ph.D. (Johns Hopkins) and three post-doctoral years in computer science (Cornell, Stanford, and U of Minnesota) to automate every aspect of our business as far as possible, which means we are making more money with less work. Utopia! BLOGGING remains the most interesting thing I have ever done. I enjoy cajoling evanescent wisps of thought onto the page everyday. My challenge is to keep my blogging (including writing and responding to comments and leaving them on other blogs) to 75 to 90 minutes. My other challenge is to maintain a balance between blogging and writing books. The former can crowd out the latter. I am enjoying Twitter. It’s a great way to introduce yourself to new people. But what do you do when your twitter stream gets too crowded? I am slowly figuring twitter out, but think I’m going to abandon Facebook for twitter. READING—The book which has influenced me the most this year has been A Thousand Gifts by Ann Voskamp. She decided to see her life as a gift, and to be grateful for everything. “In everything, give thanks.” (I Thess 5:14). This unleashes seismic changes in her attitude, spirits, happiness and mental health. CHURCH—We finally came to the reluctant conclusion that our old church, St. Aldate’s, was obviously not the right place for our family. Friends recommended St. Andrew’s in North Oxford, assuring us we’d fit right in, and, reader, we did! I love my women’s group, and the couple’s group we both attend. We left in peace, and with blessing on both sides, which made the transition easier. IRENE, 12, who took it upon herself to flatly refuse to attend church or youth group at St. Aldate’s now attends both at St. Andrew’s. Phew, well, that’s a step in the right direction. She loved summer camp at Lymington Rushmore, and our retreat at Ffald-y-Brenin, and says she is a Christian, which is also a step in the right direction. Not pushing baptism or confirmation until she brings it up. Irene had played chess competitively and intensely since she was 6 now insisted on giving it up. She has over 50 trophies, and was ranked 2ndnationally among girls of her age group. Grrr. But to be honest, our family has enough intensity, and we didn’t fight her decision too bitterly. She is flinging herself into academics, with stellar results. She is equally good at languages, humanities and the sciences, though she wants to be a writer. Zoe, 17 was pleased with her GCSE’s, all A’s and A stars. She dropped all her GCSE electives—Greek, Latin, Drama and History, and is taking Religion, Philosophy, French and English Literature for A levels. She went on a Scripture Union camp this summer, and is enjoying church youth groups, drama etc. etc. She’s a very strong Christian. Gardening—We took it up this March, and love it. We are now growing most of our veggies, and even have a winter vegetable garden. Running—Roy and I have been running for a couple of months, 3 days a week. I really love it. 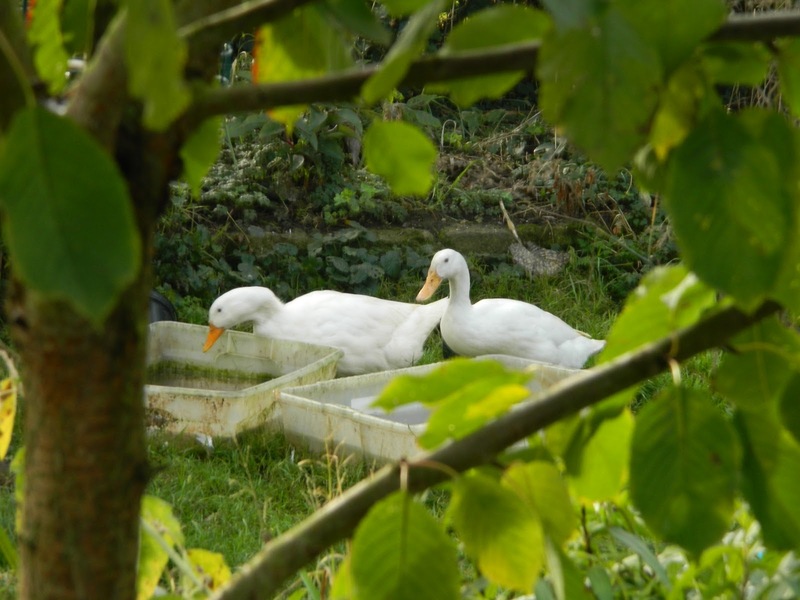 Animals—We have two new ducks, an Aylesbury and an Indian Runner, who lay lovely eggs. And a whole hive of bees!! Granada last December. Loved the Alhambra. Rome in February. What a treasure trove of museums, churches, great art, classical history, la dolce vita! Love it. Ravenna and Bologna in April. Ravenna with its 3rdand 4th century mosaics was absolutely mind-bogglingly beautiful. Bologna is a great walking city, full of eye-candy. Strasbourg in July. Another great walking city, canals, cathedrals, the middle ages washed up in the 20th century. Loved it, and Colmar. Sweden in August. Stockholm, another enchanted city I’d like to visit again, Uppsala, Gothenburg, Lake Vannern, Lake Vattern. Loved the natural beauty, and the Scandinavian architecture and history. Will visit again, particularly Stockholm. Saddest event of the year. The camper van we were renting in Sweden got broken into and we lost two expensive laptops (used for work), my new iPad, Irene’s iPod, my wallet etc. etc. And were only gone for an hour. And, on a technicality, no visible sign of break-in, our insurance claim was denied. Whoah! So we didn’t go to Malta in October and Seville in December as planned. Instead, relaxed in a cottage in Lee Abbey in October, and had a powerful, spirit-filled retreat at Ffald-y-Brenin , Wales in December. So, poorer because of the break-in, but spiritually stronger because of the two retreat holidays. God willing, we will explore Europe again next year. We are taking the girls to do London museums next week. ROY—Loves being at home, and finally having time to do all the things he wanted to do—garden, read, pray, exercise, have a super-orderly house, cook, declutter. I am gratefully leaving all the tasks of housekeeping to him. And we are both smiley. Yay for Proverbs 31 men. Failure—I haven’t lost significant weight, though I am fitter, given that I am running, lifting weights, and doing yoga. Will have to seek God for what to do about fitness. New Project for the New Year—Again, I am waiting to hear what God is saying quite clearly, but I am considering starting up a Koine Greek reading group early next year. I have a seminary professor willing to teach us. Contact me, if you’re interested. Spiritually—We went to Greenbelt in August, though it was a bit too cool for us! We also visited a cool Fresh Expression New Monastic Community, Maybe for several months, though ultimately settled in an evangelical church. Spiritually, I am enjoying just soaking in the Father’s love, just hanging out and listening to what He says, and, falteringly, trying to do it! Thanks Cat, Kathryn, and Mary. Mary, if you have just one retreat in the UK, I'd suggest Fflad-y-Brenin where we have just been. Beautiful, peaceful, prayer-soaked, and palpably spirit-filled. Lee Abbey is made special by being in Exmoor National Park, and on the coast. It's a beautiful world we live in, isn't it! Merry Christmas Anita! You sound like you have a wonderfully balanced life! I was intrigued that you mentioned Lee Abbey, because that has been one of our destination goals for over forty years! As we are preparing for a move this next spring (to Colorado) I've been sorting through thousands of files and came upon the brochures for the retreat center and remembered our dreams…Perhaps someday, my husband just walked in the room and asked how you liked the architecture?…Blessings for a new year of creative growth! Good! Enjoyed reading this. I almost feel like I know you now. Given my attention deficiency problems, it helped that you broke it up into sections.